As this post goes live, you have likely participated in Thanksgiving Dinner, watched some football, burned some calories during Black Friday shopping and attended a parade. Here is an extra helping of advice. Enjoy the time you spend with family and friends. Thanksgiving Dinner, a birthday party, an anniversary are great times to meet in person. Make time at other times of the year. The Internet has made it so much easier to keep in touch with family and friends. First email, then chat, now video via Skype, Hangouts or Duo and a few others. That regular contact helps. Translated from Latin to English: A sound mind in a healthy body. Healthy Mind: In school you can learn many topics, but be cautious of a hidden curriculum or virtue signaling. This goes back to educating yourself. Learn how to do minor household repairs. Get enough sleep. Not getting enough sleep is like not charging your cellphone and letting it go down to 5%. Take a nap if you need it. Don’t just lay on the sofa all day. Eat the correct foods in the correct portions at regular times. Don’t overindulge. Just because it’s there doesn’t mean you need to eat it. Breathe fresh air. My OSHA / environmental friends would have much more to say about this. Make sure your indoor is mold or mildew free. Lighting candles or spraying purfume or air freshener only masks those smells. Get outside to get natural fresh air. See hiking below. Excercise. I can’t say enough about what walking does for you. Walk at least 2 miles per day. Stretch or do yoga. Get some cardiovascular work into your day. It could be running, push-ups, cutting wood, cycling (with bicycle), boxing, martial arts or climbing a rock “because it’s there.” It all comes down to self discipline. Don’t hold onto grudges. Don’t intentionally agitate someone. Note: we don’t know a majority of what we say or do that offends someone. Speak your mind, but don’t speak behind someone’s back to try to tarnish their reputation. Meditate or pray. When you wake up, ground yourself. It could be reflecting on a Bible passage, doing yoga or listening to soft music or sitting outside listening to the birds singing. Another note: in many religions there were and are specific times for prayer: waking at the first light of dawn, sunrise, mid-morning (usually coffee break), high noon, the mid-afternoon, sunset, about 60-90 minutes after sunset, and before sleeping. If you wake up in the middle of the night from a bad dream, reflect on that, then reflect on something positive. There is something rejuvenating about a hike. I like the ones with some change in elevation. Not only do you get walking, you get cardiovascular. The scenery is amazing and great for photographic opportunities. The end of Ice Box Canyon Trail in Red Rock Canyon. December 22, 2017 at 9:34 a.m. PST. This is post 4 of my alphabet posts. Go to http://www.gisday.org/ to read more about GIS Day. Where am I? Where am I going? What was / is / will be there? Can you help me? 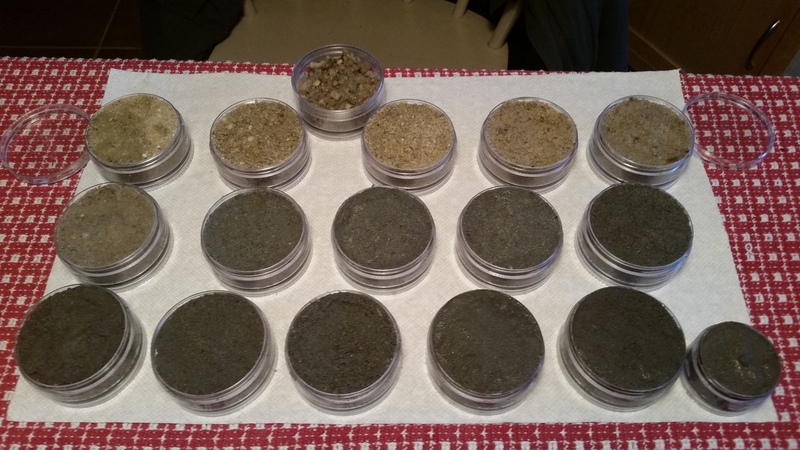 You could get soil samples. I recently had to have a new well installed. In order to figure how deep to place the submerged pump, Hoover had to get beyond the high iron levels. 20: More gravel and small pebbles. 25^: Loads of pebbles (clear Cape May Diamond types, white, pink, tan). Beautiful, if you ask me. 30: Sand (1 mm diameter) high iron content. 40: Sand with iron (getting finer). 50: Sand still getting finer. 60: This almost looks like beach sand. 70: Grey sand (now that’s different). 100: Now we’re talking, it’s getting darker. 110: Still darker (more organic). 120: Still darker (more organic). 130: Still darker (more organic). 140: Still darker (more organic). 150: Now that’s almost black (rich organic, no iron). Little one: Material used to hold pipe in place. Physical storage for maps, photographs, deed books, core samples of soil, rock or ice. Digital storage going back to magnetic tape, CDs or to today a multi Terabyte server farm. I need to get a drawer for large maps. Then you need to process the information. Usually a person, computer and or both. Create a map by hand or digitally. or computer application. 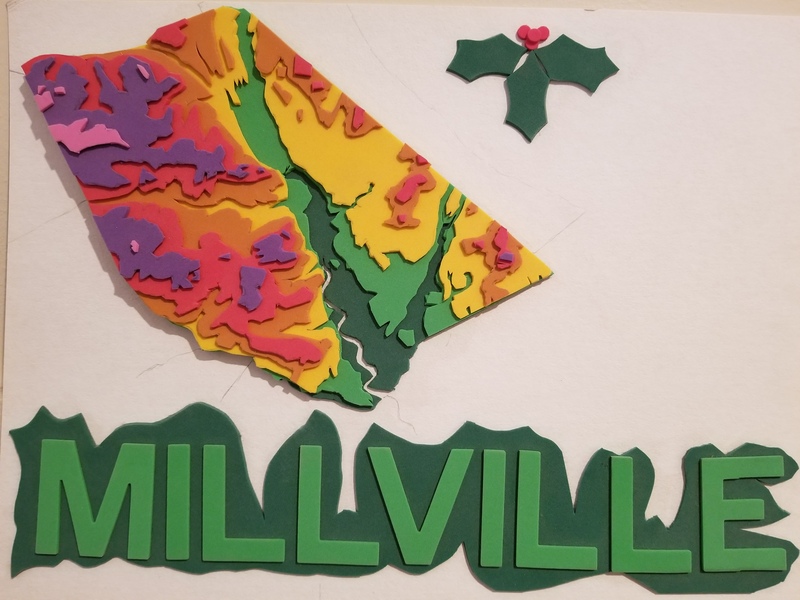 Millville, New Jersey Topographic Map derived from ESRI elevation .shp files. Then you need to share that information. Go to NJ-Web Geo 3.0. If you scroll down to the layers of imagery, you can see topographic maps from the 1880’s and 1960’s with modifications, aerial photographs from 1930, NJDEP wetlands basemaps from 1970, tidal maps from 1977, infrared from 1995, 2002 and 2007. Then more images have been collected at a faster pace natural for 2007, 2010, infrared for 2012, then natural for 2012, 2013, 2015 and infrared for 2015. Google Earth, Google Maps, Bing, Mapquest, ESRI, too many to count. To see how many, check this link from checking the latitude and longitude of Millville, New Jersey from Wikipedia. At this point, Google Maps and other maps are collaborative, so people and businesses can verify information (with some error) and provide photographs. If you take a picture of a landmark with a new digital camera or a smartphones, the photograph will include embedded date, time and location including orientation. In the United States, we have a system of roads that run from coast to coast, from Mexico to Canada, and between major cities. I just wanted to create headings of G, I and S.
Spatial Intelligence involves layers of multiple data sets based on location or time. You can create a map that has applications that connect business, education, other industries and organizations. As with many of my posts, I will be editing to correct or enhance my blog. This is post 3 of my alphabet posts. That’s a proverb based on meddling in other people’s business. It may have been about a cat that climbed on a really high roof. If you think you know everything, that’s an arrogant assumption. If you think you can’t learn or refuse to learn, change your attitude. If you have difficulty learning, maybe because “school” was tough, but you’re still curious, you can still learn. With all of the resources available at libraries or online, you can learn anything. 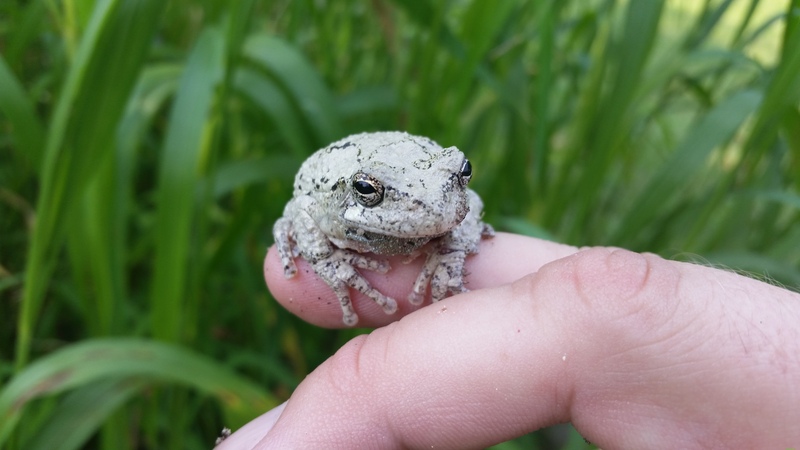 Do you have a friend who works in a different field? Ask them about their job. Make something. In 2011, I wanted to cut some plywood – problem – the saw horses were deteriorating – solution – make new saw horses. Learn how to fix your own things, within reason. Know when you need to get a professional. Learn how to sing. It doesn’t matter if it’s Gregorian Chants, Broadway Show Tunes, Hymns or Rock and Roll (1950’s – 1980’s preferably). Be willing to listen to others. You may learn something. As parents, teachers or mentors, we need to encourage questions and curiosity in others. At the age of 4, I saw a clock with Roman Numerals on it at my grandparents’ house. I asked my parents why was an “I … XII” where “1 … 12” should be. They told me with no hesitation. Do the same for any child, adolescent or adult. Be that friend who is willing to help or give advice. Set up a discovery area at home. That goes back to “Make Something”. Make every trip or visit an adventure in learning. “Are we there yet?” If you can calculate the ETA and you teach how to tell time (digital and analog), then that question will be asked less. Be willing to speak to others. They may learn something. You may learn something as well. This is post 2 of my alphabet posts. I will be editing this now and then. I’m getting ready for GIS Day November 15, 2017. My next post.